The heads of the U.S. and Indian navies met at the Pentagon this week to discuss ways to ways to integrate and improve interoperability. 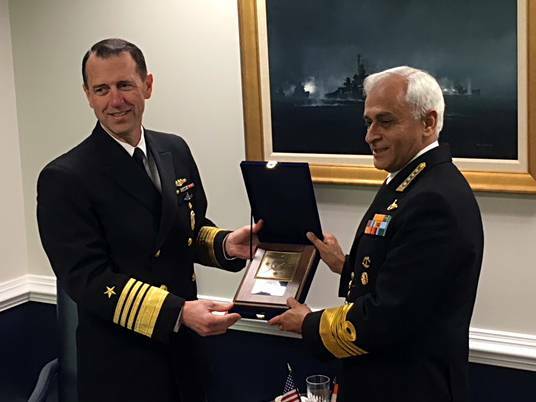 On March 21, U.S. Chief of Naval Operations Adm. John Richardson hosted Indian Navy chief Adm. Sunil Lanba at the Pentagon, where the two met with Secretary of Navy Richard V. Spencer to discuss ways to improve interoperability to include additional naval exercises and staff talks. The meeting was the fourth between Richardson and Lanba. The two last met at the IMDEX Asia defense conference in May 2017.